Latin America and the Caribbean needs higher growth without increasing debt. This column, based on the new 2017 IDB macroeconomic report, argues that completing intra-regional trade integration is a low-hanging fruit. Trade deals abound, the region has advanced, but regional trade is low – current agreements are too complex and inconsistent. A bottom-up, concrete, politically viable action plan is outlined. Deeper integration would boost growth in any scenario, but the pay-off is even larger if the world becomes more protectionist. Note: estimated with a statistical model of the world economy (a Global Vector Auto-Regression or G-VAR) developed at the IDB, including 14 countries in Latin America and the Caribbean. As discussed in previous Inter-American Development Bank (IDB) Latin American and Caribbean Macroeconomic Reports, it is often the detail of fiscal policy that is critical for its success. The region responded to the Global Crisis with a fiscal impulse, but an analysis of actual policies at that time showed that it was more a permanent increase in spending than a counter-cyclical response. Indeed, as output gaps became positive again, several countries pursued procyclical fiscal expansions leading to higher debt levels and high deficits, particularly when growth receded. As commodity revenues also fell, many countries in the region were forced to adopt fiscal adjustment programmes.5 The fact that the composition of fiscal policies is now more appropriate to the situation is welcome news and implies a much-improved probability of success. 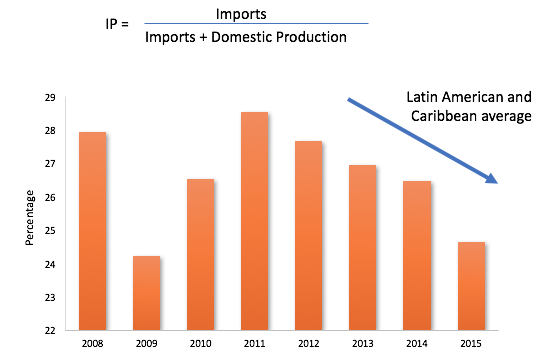 Source: IDB estimates based on INTrade system data. In more recent data, dollar export values are also rising, although the fall in commodity prices and the generally slower growth in global trade clearly had an impact. Still, IDB estimates suggest that the required external adjustment process is close to completion in the majority of countries, implying that growth should now come more easily. Monetary policy remains finely balanced. Some have commented that as policy interest rates have been raised with GDP at less than potential, monetary policy has been procyclical. But this ignores the role of the exchange rate. While interest rates may have been procyclical, they have served as a response to large nominal depreciations. Thus, it’s likely that the monetary stance, including exchange rate impacts, has been counter-cyclical. Latin America and the Caribbean needs to find ways to boost growth and it must do so with tight fiscal constraints, and without large budget outlays. Routes to Growth argues that deeper trade integration within the region would help (Powell 2017). There are no fewer than 33 preferential trade agreements (PTAs) involving the 26 regional members of the Inter-American Development Bank. In fact, about 80% of intra-regional trade is currently under preferences so in that sense, the region is not far from a free trade area (FTA) (see Figure 3). This bottom-up approach could be voluntary in nature. Assuming certain missing links were filled, countries would tend to join rather than be left out. The plan is focused on trade; other important topics such as movement of labour, investment, environment, and finance might be left for further down the road. And it would not require any ambitious plan regarding multilateral institutions. It could be handled through current government structures following the example of the Pacific Alliance. There is a strong case to deepen integration in the region, allowing countries to reap the full rewards of the work already done, and there is a concrete way to do it. Given constrained macroeconomic policies plus the uncertainties regarding global trading relations and higher world interest rates, Latin America and the Caribbean needs to find new ways to boost growth. Deeper integration in the region is a low hanging fruit and the time is ripe for the picking. Editors' note: Launch meetings for the 2017 IDB Latin American and Caribbean Macroeconomic Report will be held on 6 April at George Washington University, Washington, DC (see https://elliott.gwu.edu/routes-growth-new-trade-world) and on 11 April at Canning House in London (see https://www.canninghouse.org/events/latin-america-caribbean-routes-growth-new-trade-world/). Arenas de Mesa, A (2016), “Sostenibilidad fiscal y reformas tributarias en América Latina”, Economic Commission for Latin America and the Caribbean and Inter-American Development Bank. Cesa-Bianchi, A, M H Pesaran, A Rebucci, and T Xu. (2012), “China’s Emergence in the World Economy and Business Cycles in Latin America”, Economía 12(2): 1–75. Christiano, L J, M Eichenbaum and C L Evans (2005), “Nominal Rigidities and the Dynamic Effects of a Shock to Monetary Policy”, Journal of Political Economy 113(1): 1–45. Corbacho, A, V Fretes and E Lora (2013), More than Revenues, Palgrave-Macmillan, Inter-American Development Bank Flagship. Giordano, P, M Watanuki and O Gavagnin (2013), “Modelo de equilibrio general computable BID-INT: marco teórico y aplicaciones”, IDB Technical Note no. 505, Washington, DC. IMF (2017), World Economic Outlook (January update), Washington, DC. Mesquita Moreira, M (ed). (forthcoming), Making Sense of Regional Integration in Latin America and the Caribbean, Washington, DC: Inter-American Development Bank. Powell, A (coord. 2012), The World of Forking Paths: Latin America and the Caribbean Facing Global Economic Risks, 2012 Latin American and Caribbean Macroeconomic Report. Washington, DC: Inter-American Development Bank. The IMF World Economic Outlook (January update) indicates 1.2% growth for LAC for 2017. On the G-VAR methodology, see Powell (2012) and Cesa-Bianchi et al (2012). This simulation is calibrated such that the net shocks are neutral on US growth; see Powell (2017) for more explanation. For example, Chile, Colombia, Jamaica and Mexico all implemented successful tax reforms in recent years; see Box 4.1 in Powell (2017) and Arenas de Mesa (2016). On the need for such reforms, see Corbacho et al (2013). Such plans are attempting to improve fiscal balances on average for about 2% of GDP with 0.6% of GDP current spending cuts, 0.2% of GDP capital spending cuts and a 1.2% of GDP increase in revenues (Powell 2017). See Appendix D in Powell (2017) detailing an econometric analysis at the economy level, manufacturing sector level and at a disaggregated level with many manufacturing sub-sectors. A decrease in import penetration as a result of exchange rate devaluation is found in most specifications using traditional real exchange rates and import weighted real exchange rates. The model adapts Christiano et al. (2005) but adds a fiscal policy rule, partial pass-through of exchange rate changes to prices, a role for imported inputs in domestic production and a commodity sector; see Appendix A in Powell (2017). The model was calibrated for Brazil, Chile, Colombia, Mexico, and Peru. 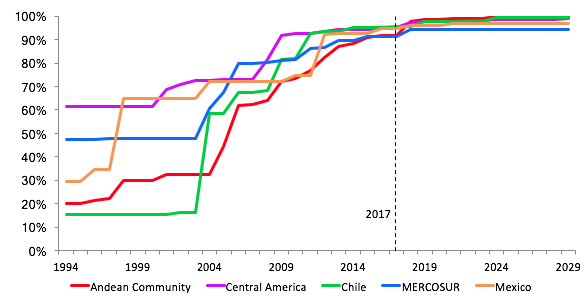 An estimated gravity model considers the impact of (a) preferred trade areas within the region such as the Andean Community, Central American Common Market, CARICOM and MERCOSUR, and (b) North-South PTAs such as NAFTA and CAFTA; see Powell (2017) and Mesquita et al (forthcoming). This statement comes from simulations of a computable general equilibrium model with various scenarios of global trade and the potential LAC response; see Appendix E in Powell (2017) and Giordano et al. (2013). See Box 6.1 in Powell (2017), which summarises the history of integration in LAC. Cumulation is a term used to describe a system that allows originating products of country A to be further processed or added to products originating in country B, just as if they had originated in country B. See Box 6.2 in Powell (2017), which considers the impact of trade on inequality in richer industrialised countries and in poorer emerging economies, and Silva and Messina (forthcoming) on inequality in LAC.